The popularity of heat pumps continues to rise. While the popularity is partly due to the energy efficiency ratings heat pumps have been getting, it is also due to all of the other benefits installing a heat pump can offer you. If you experience any issues with your heat pump, call our professionals for HVAC pump service in NYC. NY Pump provides HVAC pump service in NYC. With the increased popularity of heat pumps comes the need for them to work consistently throughout the year. Our specialists are experts in HVAC pump repairs and replacements, working hard to restore your heat or cooling without delay. Featuring affordable prices and prompt service time, your HVAC pump's function will be restored without delay. Before you're left in the cold (or the heat), visit The Hose Shop for professional, timely service. The most obvious benefit of installing a heat pump is the pumps ability to provide your home with warmth. All you have to do is press a button and the heat pump will quickly increase the temperature of the room it has been installed in. The reverse cycle of a heat pump allows it to work backwards in order to provide you with air conditioning as well. Instead of extracting heat from outside and bringing it into your home, it extracts the heat from inside of your home and pulls it outside. If you notice that your heat pump is not cooling or heating your home, call our experts for HVAC pump service in NYC. A heat pump makes it easy for you to control the climate and comfort level in your home. You just adjust the heat pump to stop working when the room it is in reaches a certain temperature. If the temperature goes up or down, the heat pump will kick back on to readjust the climate of the room to keep you comfortable. Heat pumps are convenient and easy to use as you tell it what to do by switching it from heating to cooling (or vice versa) and pressing a button. The heat pump will spend just a few minutes adjusting the temperature of your room. If it does not, you may be experiencing a malfunction and require HVAC pump service in NYC. You do not have to worry about turning the heat pump off when you go to sleep or when you leave as it is not going to cost you a fortunate. This means you will be able to return home or wake up to a comfortable home. A lot of heat pumps even come with a programmable timer which will allow you to set the heat pump to heat up or cool down a home before you wake up or before you come home from work. A heat pump also does not create any ashes, smoke, moisture, or other waste materials. This means you have nothing to worry about removing or cleaning up. You don’t have to take any trips to get wood or petroleum and you do not have to worry about emptying and reservoirs. You can just enjoy your comfortable room. For more information about our HVAC pump service in NYC, call NY Pump at (718) 768-8700. Cooling tower pumps are essential to any larger system that needs to remain below a certain temperature for optimal operation. 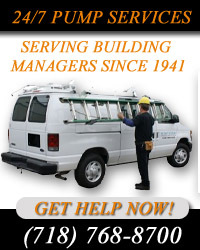 Their main job is to remove excess heat from any type of plumbing system. You’ll find cooling tower pumps in places like oil refineries, chemical plants, and power stations. Regular cooling tower pumps repair in NYC, as well as regular maintenance, is critical for them to run as efficiently as possible. At NY Pump, our cooling tower pumps specialists are equipped with the knowledge, training, and experience to bring your cooling tower pump back to working order without delay. We are committed to your satisfaction, providing affordable cooling tower pumps repair in NYC when you need it. With over 70 years of trusted service, you can depend on NY Pump for all of your cooling tower pump needs. Most people think that any problem with a cooling tower pump results in having to purchase a brand-new system, which can be thousands of dollars. However, repairs are often the more logical and cost-effective option and can extend the life of the system for an additional 5 to 10 years. Inspect the condition of the water distribution system, and provide a detailed report of the findings. Evaluate the consumable components of the cooling tower including heat transfer media (fill), inlet louvers, and drift eliminators. Examine the collecting basin with special attention given to seams and mating surfaces. Inspect all of the mechanical components of the pump including motors, belts, gears, bearings, and fans. Once the evaluation is complete, you can discuss options. We will provide you repair options before considering a new cooling tower pump. Of course if a completely new pump is the safest option, then we will recommend that. Once we complete cooling tower pumps repair in NYC, you can call on your technician tor regular maintenance of the pump. We will replace parts as needed, clean debris from cooling coils, repair insulation, and so much more. With our cooling tower pump technician in your corner you can rest easy, knowing that your pump will continue to run in peak condition for years to come. For more information about our experienced cooling tower pumps repair in NYC, call NY Pump at (718) 768-8700.